The dog is man's best friend..he is loyal and very affectionate to his owner and most people. A pet dog is very determined to please his owner and best friend. We have a dog and he is just as much part of the family as any of the people in our house. We love our dog very much. So it makes sense to me that if you have a pet dog, you might want to make a craft that represents your little doggy. You can make a pet dog out of paper, felt, foam, fabric, or even a jar. There are many creative ideas that you can find on this page that might inspire you to make a great dog craft. Have fun. This dog is made with empty spool threads, wire, felt, and beads. Take a wire and thread it through the first spoool, and then tie a knot and thread it back into the head of the spool. This is the dog's head. Then come down at a right angle for the dog's neck and put another spool on the wire. Then twist another wire around that wire and put beads on it for the dog's legs. Then bed the wire and put 4 spools ont he wire...then wrap the wire around that wire for teh dog's legs. Tie a knot at the end of the beads. You can use felt for ears...and glue it on. Draw eyes on the dog's face. Look at the paper diagrams instructions above. Fold Letter A and Lett B four times over. Cout slits in letter 'A' as you see above. These slits for the bend of the neck . 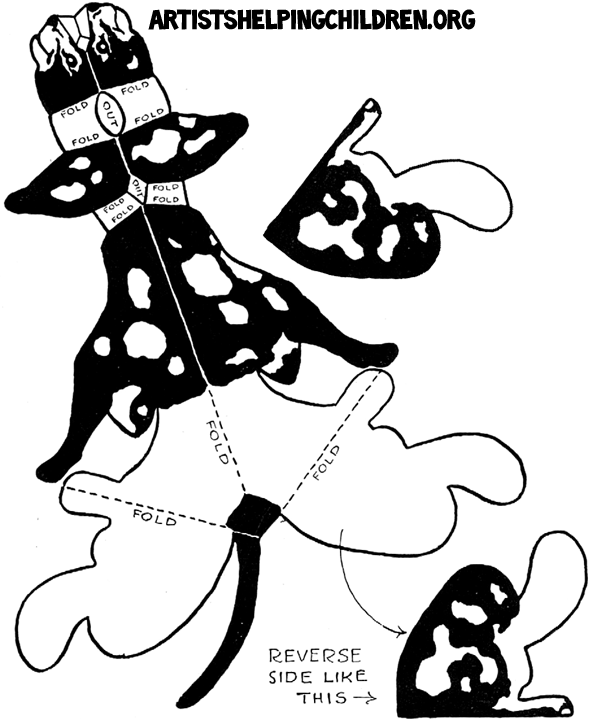 To make the legs of the dog, use diagram letter b. fold ov er letter b...for each leg. Fold letter 'c' over for each of the dog's ears. Connect everything together with paper fasteners. Here is a craft for a stand-up paper dog. You can print out the template here. Just print out this template and then cut it out. You can color it in if you want to. Then just follow the folding directions on the template and that is it, it should stand and look 3-dimensional now. This craft is to make a puppy doggy money bank and it is made out of an empty frozen juice can. Just empty it and wash it out and let dry. Ask your parents to help you cut a hole at the top of the can. Then just color the sides brown or cover with brown-ish paper or felt and then glue down. Here is a printable dog template. 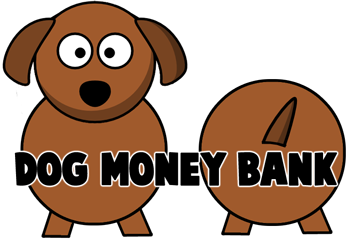 Use this for the front and back of the doggy bank. Glue it to cardboard to make it sturdier and then cut it out and glue to front and back of the frozen juice can. Just make sure that the front and back legs line up correctly so that it will stand straight. Lay it on its side while it dries. To make the above puppy doggy mask, just print out the dog mask template and follow the directions that are with it. 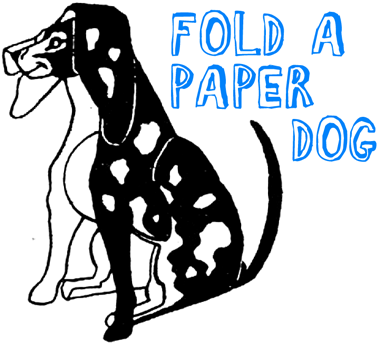 Here is the easiest stand-up paper dogs craft because there is no folding involved. Start out by printing out this paper dog template. To make it sturdier, print out the template on card stock. Then cut out the body and legs. Next, cut the dotted lines for slits to insert the legs into the dog's body. Then insert the dog's legs and stand him up. How to Make No-Sew Stuffed Puppy Dog Animal Toy with Socks & Rubber Bands - Today we will show you how to make stuffed puppy dogs out of socks and rubber bands. This craft will probably take less than 10 minutes for you…it is that easy. These are no-sew stuffed animals…that is right…no sewing necessary at all. If you like sock monkeys, but you were too lazy to make them, then this arts and crafts project is for you. Have fun. Instructions Here. Make a Dog from Bumps Chenille Stems - There is a neat type of pipe cleaners that has Bumps in them...you can make these standing dogs with them. Find out how here. Wooden Poodles - Taking a block of wood and cutting a poodle shape out of it...and then whittling it down to look 3-dimensional is difficult to do. Find out the techniques with this step by step tutorial. This craft is for older children and teens - and parental assistance is required. Adorable Knit Puppy Dogs Craft for Kids - - Looking for a cute four legged friend but don't feel like cleaning up after it? This free knitting pattern is the perfect solution. Knit yourself a cute little puppy. Bernat boa makes him such a soft friend. Baby Food Jar Puppy Dogs Crafts What does your pet look like? How about the pet you wish you had? Make one out of a baby food jar. They're cute and easy! This idea comes from Lisa of Anniston, Alabama. Balloon Twisting Balloon Dog Tutorial - We're going to proceed and twist a simple figure -- that perennial favorite, the dog. Next time, we'll talk about the dog, and how to use some simple techniques to create a variety of other figures from Rover. First, though, we need to make the basic dog. Beaded Dog Album Arts and Crafts Project - - Capture your cute pooch in beaded beauty. This is a fun album cover concept that works for any pet. Beagle Paper Cutting and Folding Craft - - Beagles have a docile, patient, friendly temperament, making them perfect playmates for children too. This Papercraft Beagle is about one third the size of the real dog. Biscuit Dogs Craft for Preschoolers & Toddlers - - Instructions for making a dog craft using a dog biscuit. Bulldogs Paper Bags Arts & Crafts Activity - - Transform a paper bag into a cute bulldog. Bulldogs Paper Crafts Activities - - Britain Personality: Dutiful and brave. Gentle and docile. Calm and loyal, unperturbed small disturbances. Cavalier King Charles Spaniel - - Britain Personality: Bright and intelligent. Quiet and affectionate. Cheese Dog to Make - - Tucked in a New England style frankfurter roll, this charming cheese dog has mastered a special trick -- putting a smile on your child's face in no time flat. Chihuahua - - The Chihuahua is thought to be a descendant of a breed of dog called the Techichi. The Techichi was the dominant breed in the 9th century in the area that is now Mexico. The Techichi was a pet of the Toltec people. Christmas Puppy Card - Create and send one of these adorable puppies to someone special this holiday season. They won't be able to resist falling in love with this cute card, doggone it! Craft a cute origami dog with your kids - - Looking for a fun kids' activity? Have a little bit of spare time and paper to match? Make a paper dog with origami, the traditional Japanese folk art of paper folding. This free origami video lesson presents complete instructions on how to make your own canine from folded paper. For more information, and to get started making paper puppies yourself, take a look! Cute Poodle Dog Paper Craft - - Many children love dogs. They are human’s best friends. But, not every child has ability to have dogs in their home. If you ever feel those conditions, you must be sad. But, don’t worry, because you can make dogs and poodles from paper craft. You know, for the first time this is an art paper craft from Japan, but lately, many people love it. They develop technology to gain good quality paper and high quality color also. 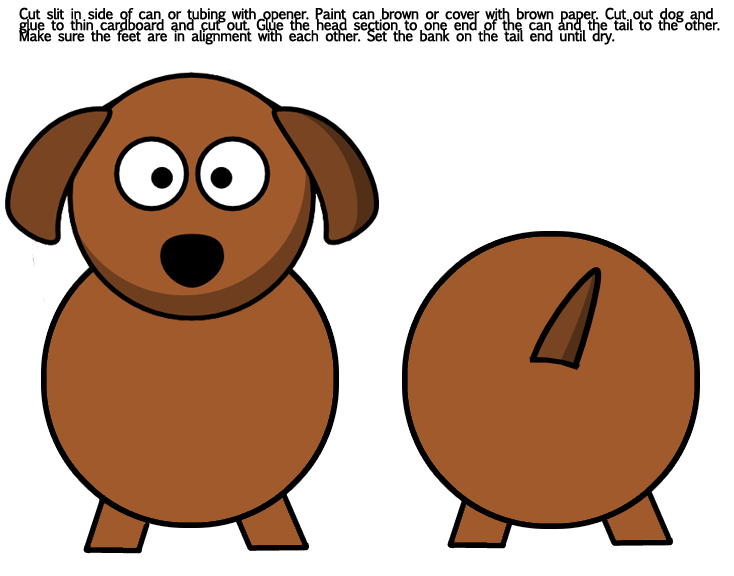 Dachshunds Paper Craft Activity for Kids - - While today' s Dachshunds are considered loveable domestic dogs everywhere, they used to be treated as hunting dogs in Germany, the country of origin. Daschund - - Create your very own Daschund. Dalmatian - - Dalmatians were used to guide or protect the carriage. In America, there were many heroic rescues performed by Dalmatians leading horse-drawn fire engines. The Dalmatian remains known as an unofficial mascot of the fire brigade to this day. Dalmation Costume - - Use these ideas to create a unique and simple dalmation costume. Dalmatian Dog Toilet Paper Roll Craft - - You can either make the Dalmatian with the fire hat (for a fire man's helper) or without. The dalmatian toilet paper roll craft is a fun and easy cut and paste craft that uses a toilet paper roll as a base to give it a three dimensional effect. Dashing Dog Envelope - - Transform a simple envelope into a delightful dog. Delightful Dalmatians - - Transform a white cup into a cute dalmatian puppy! Delightful Dog Card - - Make a great dog card for dog lovers. Dimensional Dogs with Collars - - Create your own free-standing 'Fido' with a colorful collar. Doctor D Doggy Craft for Preschoolers & Toddlers - - Doctor Doggy loves to diagnose. Dog Corks Craft - - Make this unsual dog out of corks. Dog Bottle Bank - - Recycle a 1-liter bottle into an adorable puppy to watch over your money. This is a great green crafting project for kids. Dog Box for Valentine's Cards - - You can replicate the same type of craft using craft foam by tracing the template pieces onto foam and drawing on a few of the details. Dog Craft - - Children will use and develop fine motor skills. Dog Craft Foam Visor - - Find out how to create this fun dog visor using craft foam and a few other supplies. Dog Crafts and Learning Activities For Kids - - Kids will have fun and also learn with these dog crafts and activities. Dog Crafts for Kids - - Dogs seem to provide kids with a favorite subject when drawing pictures. Take advantage of that enthusiasm with a variety of crafts for kids. Crafts simple enough for the youngest kids require little more than paper, crayons and imagination. For older kids, dog crafts can involve many more materials, details and steps. Choose a dog craft for your kids carefully so that you have a suitable and pleasurable experience. Dog Ears Headband - - Follow these directions to make a headband you can wear that looks like dog ears. Dog Glove Pet - - Puppies galore! A glove makes quick work of this fun project. Dog Paper Craft - - This puppy dog is a simple cut and paste paper craft that is fun for young children to make. It makes a great project for preschool and kindergarten kids and works well for an animals, pets or letter D theme. Dog Pattern for Beaded Safety Pins - - Pattern works with three sizes of beads and pins. You choose the size you want. Dog Paw Stockings - - Cut your family's furriest friend in on the action -- this stocking's big enough to hold a bone that will last all day. Dogsled Adventure - - Research dog sledding and the Iditarod competition then build your own model dog sled team. Dog Themed Cross Stitch Pattern - - One slightly more complex cross stitch pattern for children to make. Dog-themed Rice Pack - - This rice pack can be heated in the microwave to warm up a sore muscle or chilled in the freezer to reduce swelling. This is a fun project to make with the kids. Read on for directions. Dog Toilet Paper Roll Craft - - You can make this cute, three dimensional dog craft for a variety of themes (pets, animals, the letter D, farm) or just for fun! Dog Toilet Paper Roll Craft - - This is a simple three dimensional animal craft that is fun for kids to make and play with. Dog Walker - - You won't have to remind your child to walk the dog this Halloween with this role-reversing pair of costumes. Smartly dressed in suit and tie, your little gent will have a howling good time taking his pretend pooch for a walk around the block. 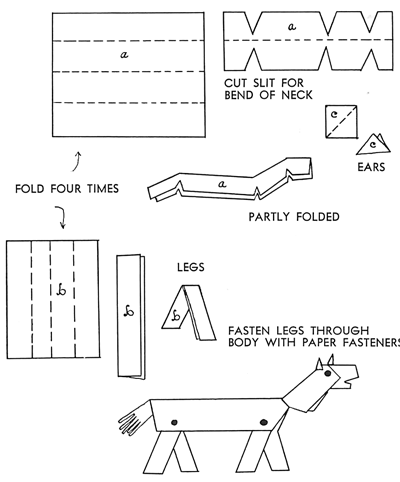 Dog Paper Model Craft - This is a printable paper model of a donkey, cat, chick, dog and a box. Dorbermann - - Germany Personality: Affectionate, obedient and loyal. Felt Dog - - This is a terrific Kindergarten Craft to work on with your kids. It’s quite simple to create and they can make the dog in any way or colors they like. Felt Dog Key Ring Charm - - Dog fans will enjoy adding more fun to their keychains or purses by sewing this cute furry friend to tag along with them. You can have this dog completely finished and ready to use within 30 minutes. Felt Pups - - Here's a pattern for an adorable dog with movable legs. It's a basic shape that's easy to transform into various breeds. For instance, add spots with a fine-tipped permanent marker for a Dalmatian, or sew on pom-pom poufs and voila, a poodle. Fire Dog Cup Puppet - - Also know as the “fire dog”, Dalmatians are known the world over to be associated with the firemen. Here’s a craft project that you can make in a jiffy. Easy enough to make for Fire Prevention Week Crafts Activity. French Bulldog - - The French Bulldog is a small breed of dog, recognizable by its "bat ears" that stand straight up on top of its head. It has a sturdy body and its coat is short and silky. The short length of the tail means the French Bulldog can not wag its tail much. Its bright, curious, affectionate temperament and the fact that it does not bark much makes it a great pet. Furry Friend Frames - - In this artistic dog craft, you'll bone up on pet trivia, and decorate a frame to honor your family's furry pal! Each family member can decorate their own furry friend frame, or you can all collaborate on one frame. German Shepherd Dog - - Germany Personality: Quick and intelligent. Obedient with their owners. Golf Ball Dog Craft - - Make this special dog a golf fan can display on a shelf or even used as a paperweight! If the person you are making this.pngt for does not like golf, you can use small Styrofoam balls that are painted to resemble the balls from their favorite sport such as basketballs, baseballs, or soccer balls. Handprint Dog Craft - - Another original handprint craft from FreeKidsCrafts.com! Just trace, cut and color. The best part is that no two will be alike. Heart Dog Paper Craft - - Read a bit about DLTK's Grow With Me Craft Concept to get some ideas on how this basic craft idea can be used with different materials to make it appropriate for everyone from ages 2 thru 82! Hot Dogs - - A very lengthy craft for dog lovers! How to craft a puppet dog with your kids - - Puppies are one of the most cutest animals out there and the most popular with humans. So why not make a cute puppy made from paper to enjoy for days. This tutorial will show you teachers or parents, how to make a cute puppy dog out of different colored paper. Enjoy! How to Create Balloon Animals : a Dog - Creating animal balloons is both fun and exciting with a group of kids appreciating your talents. Creating animal balloons is easier than you might think, once you learn a few basic twists and how the balloon works when you manipulate it, creating new and exciting designs becomes second nature. How to Make a Clay Dog - - Need a simple hands-on clay craft project? This little clay dog is basic enough for children and adults to enjoy making and can be an excellent family activity for canine lovers of all ages. Make it from your favorite modeling clay or craft dough, then paint it to look like the family pet. When finished, it can be a toy,.pngt or decoration. How to Make a Dog Ear Headband - - This dog ear headband is a simple way to identify a dog character in a play or could be used for a Halloween costume or dress up play. It is comfortable to wear because of the use of plushie felt and it eliminates the need for a bulky hood or mask that may obscure vision. This dog ear headband can easily be sewn together in an evening, leaving you more time to create the rest of the costume. How to Make a Dog Sock Puppet - - Sock puppets are a classic children's toy. Re-use an old sock with rips, stains or tears or buy new socks for the project. With a few inexpensive materials and about a half an hour of time, you can create a toy that will amuse for hours. This project requires no sewing, and is an enjoyable way to spend the afternoon with your children. Swap out scissors with safety scissors and supervise them as they create their puppets, having the adults use the glue gun as necessary. How to Make a Foam Craft Dog - - For this fun, kid-friendly craft, it's time to get in touch with your heart. These foam dogs require building a dog's body and face from a series of heart-shaped foam cutouts. Use googly eyes, stickers and yarn to decorate the completed dog. These heart-shaped cuties make excellent Valentine's Day crafts. Also consider making them for Mother's Day and Father's Day.pngts. How to Make a Wooden Dog Pull Toy - - Cute handmade wooden toys can make great.pngts and a successful side business. 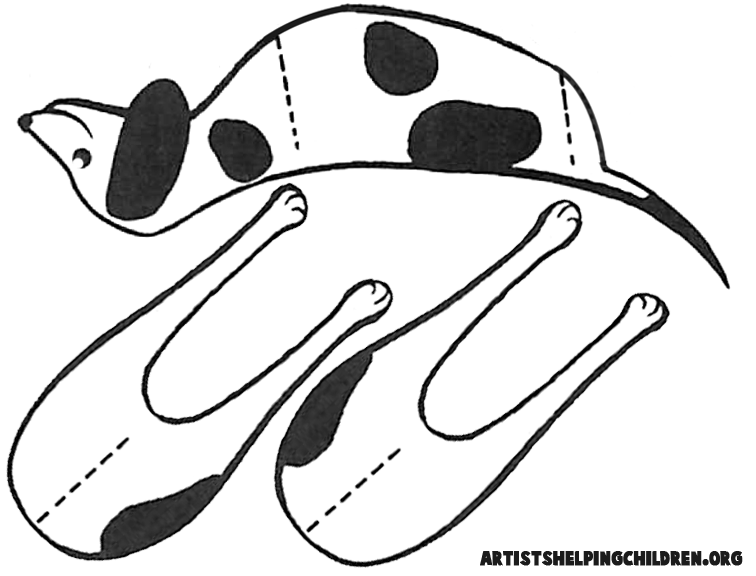 Find or draw a simple pattern, then follow the steps below to make your pattern a pull toy! How to Make Puppy Birthday Cards - - Dog lovers, whether children or adults, will enjoy receiving a birthday card with pictures of puppies. If you're a photographer, you can easily take photos of the birthday person's puppy (if they have one) and make a card that can be framed. Puppy birthday cards can be elegant or whimsical and colorful. The use of layering papers on a card gives it a nice three-dimensional effect. How to Twist a Balloon Dog, the Basic Animal - Balloon twisting can be great fun. With a few balloons, and a little bit of patience, you can find yourself making many new and exciting pieces of art. The first balloon sculptures people usually learn is the basic balloon dog or animal, created from a single balloon. Labrador Retriever (Black) - - Britain Personality: Smart, obedient and gentle. Loves to please. Labrador Retriever (Yellow) - - Britain Personality: Smart, obedient and gentle. Loves to please. Letter D becomes a Dog - - Transform a letter D into a cute dog's face. Miniature Schnauzer - - Germany Personality: Easy to train and very loyal. Nothing But a Hound Dog... Mask - - Do you like the song this craft is named after? Or perhaps you just love dogs... Either way, you are sure to enjoy making this fabulous hound dog mask! Pantyhose Puppy - Learn how to make a really cute stuffed animal puppy dog out of an old paire of panythose. Paper Bag Dog Craft - - You can make a Dalmatian type dog like the one in the picture or use different colors for a grey, brown, tan or black dog. Or even a red (Clifford type) or blue (Blue's Clues type) version. Paper Bag Dogs - - Great dog puppets that are easy to make! Paper Bag Puppet Dog Craft - - Dogs are a favorite in our house and our daughter loves pretend she is a puppy, so we wanted to make a dog craft that was interactive and something she could play with. She loves this dog puppet craft and loves making the dog move and talk. We kept this farm craft simple so our daughter could put her dog puppet craft together with just a little prep work on our part and it turned out great! Paper Plate Dirty Dogs - - No self respecting working dog would endure a day without a good roll in the dust – this cute cut-out farm dog is no exception. Pick of the Litter - - The Dog-Lovers in the crowd were looking for a costume truly fit for the leader of the pack. We knew we'd hit the mark with this box full of puppies when five-year-old Bryce's eyes lit up. "I'm going to take all of my dog buddies with me!" he exclaimed. "And I'll bark when I walk!" chimed in his classmate, Michaela, age five. Pink Poodle - - This pampered pet's look comes together quickly with bath puffs, rubber bands, and two pairs of pink socks. A jeweled collar and a painted-on black nose provide the perfect finishing touches for our fab Fifi. Plaster Pooch - - Use plaster cloth to craft a canine in the likeness of your family pet. 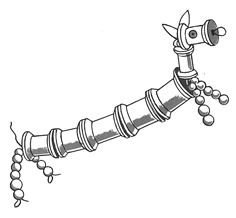 Check out Plaster Pals for basics on building this and other critters. Play With Me, Puppy - - Capture the pleasure of your puppy’s company with mess-free Crayola Color Wonder™ Paint. Plushie - Standing Dog - - This sewing pattern shows you how to make a standing dog plushie which makes a great snuggle baby toy. Presto Dots Poodle - - Ooh-la-la! Craft a Parisian-inspired pooch with Model Magic® Presto Dots and your creative flair. Printable Puppy Dog Ears Craft - - These cute little Puppy Dog Ears from the Free Kids Craft Team will turn anyone into a faithful friend. Puppy Paper Bag Puppet - - A puppet that is just too cute! Puppy Picture Frame - - Create a fun frame to show off your lovable pet. Puppy Yarn Bug - - Make a puppy dog yarn bug that looks just like your dog! Put on Pups Nose Mask Craft - Create your favorite animal nose or make up your own one-of-a-kind paper schnozzola with Crayola Squeezables™ 3-D Paint such a a pig, dog, or tiger. Red Dog Dance - - Everyone loves Clifford! Paint your own lovable red pooch doing a big-hearted doggy dance. Saint Bernard - - Saint Bernards are said to have saved thousands of lives in this area, and they are often depicted with barrels around the neck, said to contain rum for the lost victims they found.With this paper craft, you can make a model about one quarter the size of a real Saint Bernard dog. Scarf - Puppy Dog - - This free crochet pattern shows you how to make a puppy dog scarf. Scooby Doo Dog Costume - - Send your trick or treaters on a quest to solve a mystery or two in this Scooby Doo dog costume a kid's Halloween craft classic. Scottie Christmas Tree Ornament - - A Christmas tree ornament for all Scottish Terrier fans. This little scottie is decked out in his finest collar and bell to add some cheer to your Christmas tree. Shetland Sheepdog - - Britain Personality: Intelligent and obedient. Lively. Smart and easy to train. Shiba - - The Shiba we know today is a result of these protective activities. The Shiba is classified as a small dog, but it is known for being very muscular. According to one theory, the name "Shiba" comes from an ancient word meaning "small". Soda Pop Can Puppy - - Find out how you can easily create a cute puppy using an aluminum pop can. Stretchy (Accordian) Dog Craft - - Kids will have fun making this dog, decorating it and then playing with it - making it's middle stretch. Styrofoam Dog Craft - - Dottie created this dog craft in honor of National Dog Day. This craft is a great way to recycle styrofoam trays. TP Puppy Puppet Craft - - You can make any kind of animal... we made a cute puppy puppet. Valentine Mailbox : Pink Poodle - - Create a fabulous pink poodle Valentine mailbox for your Valentines! Valentine Mailbox : Puppy - - Create a cute puppy valentine mailbox to hold all your Valentines. Valentine Puppy - - Create a cute Valentine puppy! Welsh Corgi Pembroke - - Britain Personality: Strongly territorial, rather excitable. Yorkshire Terrier Papercraft + Chocolate Toy Poodle (Dogs) - - Twofer from designer Ayumu Saito of Craft Pocket, the adorable Yorkie and a choco toy Poodle.